When Prince Gautama Siddhartha, achieved his divine attainment or raised his status from a Bodhisattva to a Buddha, the ordinary Peepal (Ficus religiosa ) tree, under which he sat for those four weeks, also changed its status and became a Bodhi or the tree of supreme knowledge. It is therefore no wonder that in the Buddhist world, this Bodhi tree is considered as one of the most revered symbol of high religious importance. The original Bodhi tree was destroyed during course of time. The place, where this Peepal or Bodhi tree stood once, was known by the names such as Uruvela, Sambodhi, Vajrasana or Mahabodhi. The present name for this place, Bodh-Gaya, did not come into use until the 18th century CE. The Buddhist Vihara here at this place was known historically as Bodhimanda-vihāra. Now it is called the Mahabodhi Temple. Bodhi-Gaya is located about 110 Km from Patna, capital of Bihar state of India. It is believed that 250 years after the Enlightenment of the Buddha, Emperor Asoka of India had visited Bodh Gaya. He is believed to be the founder of the original Mahabodhi temple. Emperor Asoka had asked his son Mahindra, who had become a monk, to visit Sri Lanka along with his sister Sanghamitra on a proselytizing mission to promote the Buddhist religion. Mahindra and Sanghamitra had carried over to Sri Lanka, a sapling of the original Bodhi tree, under which Prince Gautama Siddharth had achieved divine attainment. When the original Bodhi tree in India was destroyed, a sapling of the Bodhi tree in Sri Lanka was brought back to India and planted at Bodh Gaya. A fifth generation tree of this very tree, is what visitors see here today. I have tried to narrate this slice of ancient history just to highlight the importance and great reverence, the Mahabodhi temple has in the minds of Buddhists and the Buddhist world. For most of them, Mahabodhi temple symbolizes the Buddha himself. The original Mahabodhi temple built by Emperor Ashoka, no longer stands now, but was rebuilt by another ruler in 5th century CE. This new temple is an exquisite 50-meter (160-foot) high structure and is considered bt many as an architectural marvel built of bricks. UNESCO has declared it as a world heritage site not only because of temple's religious and historical significance but because of it's profound influence on architecture in India. Temple's sculpted stone balustrades are considered as outstanding early examples of sculptural reliefs in stone. The Bodhi tree inside the temple complex, standing in place of the original tree, which actually is a fifth-generation peepul tree as mentioned above, stands about 24 meters high and is known to be 115 years old. Hundreds of thousands of Buddhist pilgrims visit Mahabodhi temple. They come from Japan, China, Myanmar, Singapore, Sri Lanka, Thailand, and several other countries. The recent visitors include many VIP's such as the Dalai Lama of Tibet; the former military dictator of Myanmar, General Than Shwe; and President Mahinda Rajapaksha of Sri Lanka. Realizing the significance of the temple to Buddhist world, an attempt was made by some, so far unknown, terrorists, to plant several explosive devices in the temple campus on 7/7/2013. 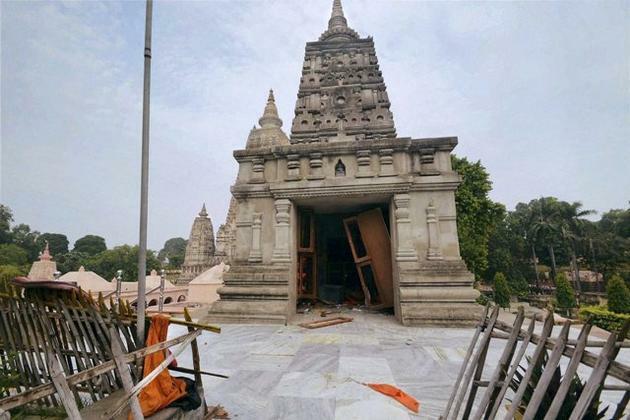 Nine low intensity bombs went off within a span of fifteen minutes, on early Sunday morning, inside the Mahabodhi temple complex. 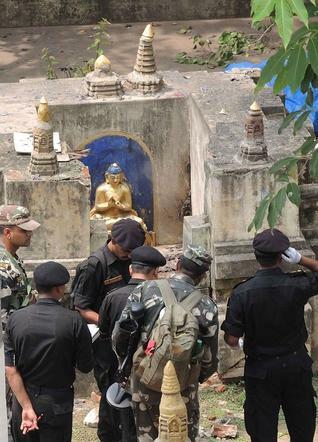 Four explosions occurred inside the temple complex, three others happened in a nearby monastery and an eighth exploded near a statue of Buddha. Two other bombs were defused. Fortunately, there were no fatalities and the blasts only caused some injuries to a couple of monks; one from Nepal and another from Myanmar, though there were about 200 people present in the temple premises, when the blasts took place. According to a person present, the temple was engulfed in black smoke. And there was a great panic near the temple for the first time ever. The reasons for the panic are easy to understand. 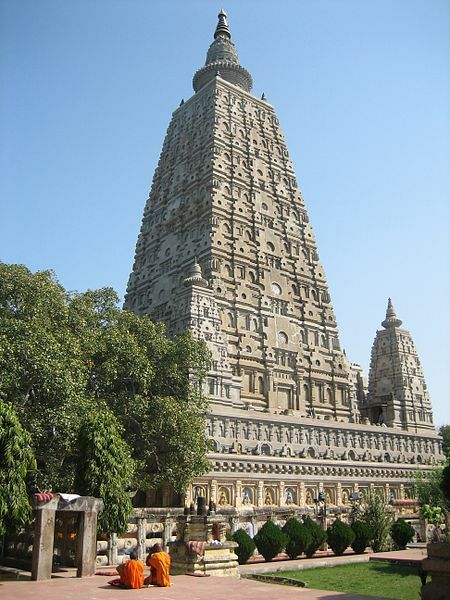 Mahabodhi temple epitomizes everything that Buddhism stands for. Traditionally there never was any elaborate security cover for the temple with temple gate just manned by mere two armed security personnel. Some private guards have been employed by the temple management to handle the light security requirements inside the temple. There are few metal detectors and close circuit cameras installed near the gate too. 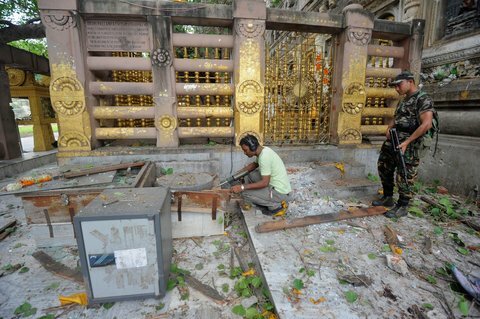 All the CCTV cameras in the Mahabodhi temple premises, have been fully functional. Though no terrorist organization has made a claim, the needle of suspicion is towards an Islamic militant group, Indian Mujahideen because about 9 months ago, The Delhi Police Special Cell had, on the basis of revelations made by alleged Indian Mujahideen terrorist Sayed Maqbool, shared the inputs with Government of Bihar state, where this temple is located, that this banned outfit planned to target the Buddhist shrines in Bodh Gaya. However, this warning had gone in vain as Bihar police did not take up any concrete action plan for safeguarding the temple. But why select MahaBodhi temple? This was the question that quizzed many people, as really speaking, Mahabodhi temple epitomizes teachings of peace and tranquility. An Indian newspaper 'The Hindu' reports that “There have been intelligence inputs that [some Islamist groups] were planning to target Buddhists and their religious sites with foreigners in mind, as a retaliation for atrocities being committed upon Muslims in Myanmar. This follows the ongoing sectarian violence between Rohingya Muslims and Buddhists in Myanmar.” Terrorists had planned these attacks as a revenge for atrocities being committed upon Muslims in Myanmar. What this means is that echoes of the sectarian violence between Buddhists and Muslims in Myanmar have now reached the shores of India. All of the Buddhist revered sites in India now come under this shadow and it would be necessary for the Government to provide same level of security at these places too, as is being done at some of the important Hindu temples like Somanath or Dwarka. What an irony of fate it is, that the places that epitomize the Buddha himself, have to be now protected with armed guards, metal detectors and closed circuit televisions.